When it comes to training a Husky, there are several different methods for doing so. 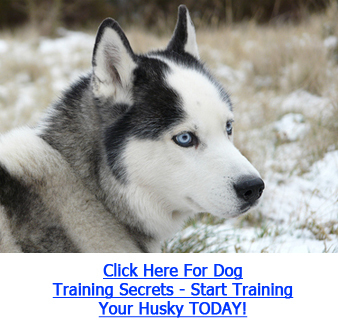 The most important factor in choosing a training method is to go with one that’s most effective for Huskies. However, no matter which method you choose, lots of patience, consistency and understanding are required in successfully training a Husky. When training a Husky, you must establish an alpha relationship, where you are the alpha leader. This means that you must not display submissive behaviour to him if you are to be seen as the leader. For more information on how to be the alpha, I would recommend downloading a free copy of How To Be The Alpha Dog And Stop Your Dog’s Behavior Problems. Because Huskies can be so stubborn, the hardest part of training a Husky is probably grabbing their attention – and keeping it. A helpful tip is to have his favourite treat or toy in hand while doing the training so that he will be more likely to keep his attention on you. When he performs the correct action, you can offer him the treat or toy, which will establish a positive association with what he just did. Most experts agree that positive reinforcement is the best approach for training a Husky. You will want to concentrate on rewarding him for doing positive things, rather than punishing or scolding him for doing bad things. Huskies don’t respond very well to punishment anyways and will simply ignore you. Training a Husky works differently from training say, a Golden Retriever. Huskies are often mistakenly labelled as “not very intelligent” when in fact, they are actually quite intelligent. They are simply very strong-willed and choose to obey you only when they see a point. For this reason, it is important that you are seen as the alpha. Huskies are very pack oriented, and they need to have a leader; otherwise, they will walk all over you if given the chance. After you have established an alpha relationship, you need to focus on providing consistent training through positive reinforcement. Consistency is the key to training, as any inconsistencies can confuse your Husky and render the training ineffective. For example, if you don’t want your Husky on the furniture, never allow him to be on the furniture. Don’t sometimes allow him to be on the furniture and not allow him on it at other times, or he will be confused about what is expected of him. Many owners make the mistake of not being consistent enough with their training. Being inconsistent with training is as good as not doing the training at all. With enough time, consistency and patience, you will be well on your way to having a trained Husky. Results may not happen overnight, but persistency is required for any sort of training, especially with such a strong-willed breed.